A great deal of trouble was taken by the Amalgamation Committee to ensure the success of the union of the two Infantry Regiments of Surrey in 1959. The Colonel of the new Regiment and his Regimental Secretary were both distinguished Queen's officers who had commanded Regular battalions of the Surreys. The Queen's and the Surrerys had much in common and were well known to each other. Regimental traditions and customs were carefully preserved, and serving and retired members of both Regiments cheerfully and loyally accepted the decision which brought their separate entities to an end. Thoughout the seven years of their existence, the Queen's Surreys were a happy and efficient regiment. Besides the Regular 1st Battalion, the 3rd and 4th Bns The Queen's Royal Surrey Regiment (TA) were formed and all established a reputation for military efficiency, enthusiasm and sporting prowess. 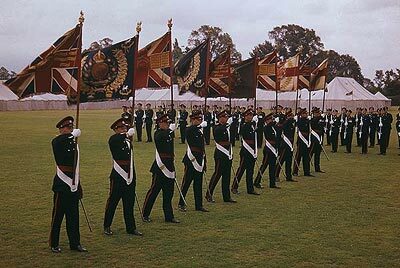 Formation of The Queen's Royal Surrey Regiment. Further strengthened and assumes responsibility for manning and postings. Formed at Bury-St-Edmunds by the amalgamation of 1st Bn The Queen’s Royal Regiment, and 1st Bn The East Surrey Regiment. Queen’s and Surreys depots close and move to Canterbury. Queen’s Surreys Depot formed at Wemyss Barracks, Canterbury. R and S Batteries 570 LAA Regiment amalgamated to form R (Queen’s) Battery. Presented with new Colours by HRH the Duke of Edinburgh at Bury-St-Edmunds. Regiment granted Freedom of Guildford then Freedom March through Town. Regiment granted Freedom of Kingston-upon-Thames then Freedom March through Town. Moves to Colchester. Joins 19 Infantry Brigade (3rd Infantry Division). Laying up of the old Colours of 1st Bn The Queen’s Royal Regiment and 1st Bn The East Surrey Regiment in the Regimental Chapel, Guildford Cathedral. Advance party moves to Aden, on the troopship Dunera. Queen’s Surreys Depot closed and amalgamated into the Home Counties Brigade Depot. 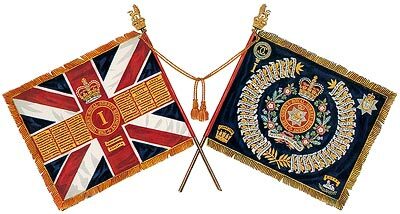 he Colours of 1st Bn The Queen's Royal Surrey Regiment. The 3rd and 4th Battalions were identical except of course for the Roman numerals depicting the battalion and in the case of the 4th Battalion which had a Tank in the centre bottom of the Regimental Colour recognising their service as a Tank Regiment during the Second World War. Main body of Battalion sail for Aden on the troopship HMT Dunera on her last voyage as a troopship. Tercentenary Banquet, the Criterion Restaurant, Piccadilly. Parade and unveiling of the monument, Putney Heath. Aden. One company detached at Mukeiras. Tercentenary celebrations. Queen’s Colour trooped in front of HRH Princess Alexandra, of Kent. Formed by the amalgamation of 565 LAA Regiment (late 4th Queen’s), 5th Queen’s, and 6th Queen’s. Bn HQ and HQ Company at Guildford, A Company at Dorking and Reigate, B Company at Camberley and Woking, C Company at Croydon, D Company at Bermondsey and Sutton. Joins 131 Infantry Brigade (44 Home Counties Division/District). Formed by the amalgamation of 6th East Surreys and 23rd London Regiment. Bn HQ and HQ Company at Kingston, A Company at Clapham and Richmond, B Company at Clapham, C Company at Chertsey, Hersham and Cobham, D Company at Kingston, Sutton and Leatherhead. Joins 47 (London) Infantry Brigade (56th London Division/District). Formed by amalgamation of P and Q Batteries (1st Surrey Rifles), and R (Queen’s Battery), 570 LAA Regiment RA at Flodden Road, Camberwell. Laying up of old 7th Queen’s Colours at St Mary’s, Newington. 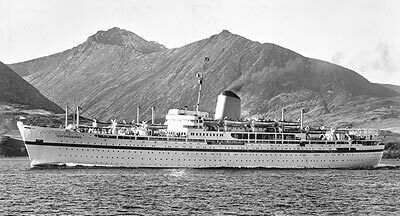 Arrives in Hong Kong on last troopship voyage of HMT Oxfordshire. Detachments deployed for the Honour Guard in Korea. Detachments at Sutton and Leatherhead closed. HMT Oxfordshire, Aden in background. Arrives in England and disperses on leave. Regiment granted Freedom of Reigate. Presentation of new Colours by the Earl of Munster, Lord Lieutenant of Surrey, at Woking. TAER men to 1st Bn in Hong Kong. Laying up of old 6th Surreys Colours at Kingston. being marched off parade for the last time on 12th July 1963, Woking football ground. Reassembles at Münster, West Germany. Joins 6 Infantry Brigade (2nd Division). APC Battalion. Laying up of old 4th Queen’s Colours at Croydon. Laying up of old 6th Queen’s Colours at Bermondsey. Laying up of old 5th Queen’s Colours at Guildford. Laying up of old 23rd London Colours at Battersea. The Queen reviews the Army in Germany at Sennelager. TAER men to 1st Bn in Germany. 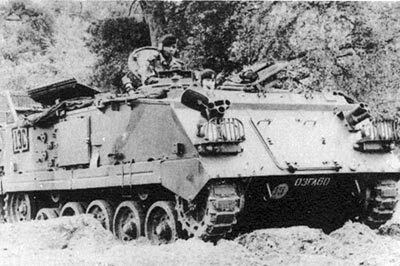 AFV 432 APC which entered service with 1 Queen’s Surreys early in 1966.